The PSNI has again warned that any border infrastructure as a consequence of Brexit could be attacked. ACC Tim Mairs said the message had been "heard and understood", but needs to continue to be stated. Senior officers have been attending a Brexit event organised by the Policing Board. 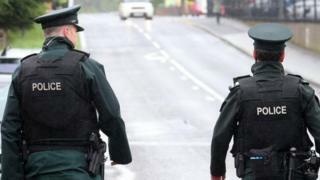 They said the PSNI is "in as good a place as possible" in terms of preparations, given continued uncertainty. It will begin recruiting "as many as possible" of the extra 308 officers it recently received £16m funding for, to help deal with Brexit. Many will be used to tackle criminal gangs operating on the border. Assistant Chief Constable Mairs said if the United Kingdom lost its ability to use European Arrest Warrants, it would be a blow. It could lead to Northern Ireland in particular being perceived "as a safe haven", he said. In November, Chief Constable George Hamilton rejected claims that the threat of violence at the border after Brexit was being exaggerated. He also said that if there was a no deal Brexit , it would "magnify all the demands and difficulties".